With plenty of seasoned Pro Bass Elites to compete against, Jordan Lee had every reason to give up and second guess himself this past weekend at the 2017 Bassmaster Classic on Lake Conroe but despite the setbacks, he pushed forward to take the coveted trophy. 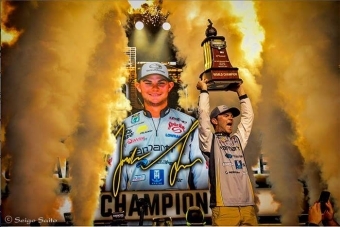 As many streamed the Bassmaster LIVE weigh-in, The Rod Glove could not be more proud to sponsor such an a great angler like Pro Bass Elite Jordan Lee. With support from his family, Jordan's passion for fishing started at a young age and he fished in 2013 on Auburn’s University Team which was a life changing, growing, experience for him that opened the doors to a future in fishing. At 23, he became the youngest competitor on the BASS Elite Series tournament trail and made his way through the ranks. At only 25 yrs old, from Guntersville, Alabama, Jordan stayed in the pack all week at the GEICO Bassmaster Classic and moved on to be the youngest angler to win the trophy. After some major setbacks, during Sunday’s final round at Minute Maid Park, he caught five bass from Lake Conroe that weighed 27 pounds, 4 ounces, pushing his three-day total to a tournament-best 56-10. On Friday, Jordan caught only three fish that weighed 8lbs 6 oz but on Saturday he returned to a spot that he had found during practice and caught some large fish but still did not catch a 5 fish limit that day. “With zero fish in the box at noon on the second day, I went back to that spot and caught a 7 1/2-pounder on the first cast,” Lee said. “When I was landing that fish, there was a whole school of 5- and 6-pounders that came with it. Jordan moved into 15th place on Saturday with 29lbs 6 oz and guaranteed him a spot in Sunday's final Top 25. With Brent Ehrler in the lead for the first two days, he entered the Championship on Sunday with 43lbs 4oz which meant Jordan had to bring in a heavy bag. Unfortunately Jordan Lee had engine troubles which left him without the ability to run from spot to spot and forced Lee to have to fish off the point. He eventually had to hitch a ride back to the weigh-in with a spectator that he knew from Cullman, Ala. — a legal ploy in the Classic, as long as no fishing takes place in the spectator’s boat. Lee earned $300,000 and the most coveted trophy in the sport, while Steve Kennedy — a resident of Auburn, Ala. — finished second with 55-1 and another Rod Glove Pro Bass Elite Brent Ehrler weighed in 11 lbs 10oz Sunday to finish in third place with 54 lbs 14 oz. “To all of the guys fishing the college tournaments right now, this just says you can do it,” Lee said. “It’s hard work — and you’re going to have a lot of days out here that aren’t good. Jordan credits The Rod Glove for his success staying organized during the 2017 Bassmaster Classic and shares his thoughts in this video. Take a look. Fishing during the week at the 2017 Bassmaster Classic, I had about 20 -25 rods in the rod locker. Without the Rod Gloves I would not have been able to save time. The Rod Glove is always a part of me and helps me to save time. Rod Glove has helped me in many of ways. With kayak tournament fishing just like all tournament fishing comes a lot of travel and keeping your gear protected. Nothing works better than a Rod Glove. Even now while I am out on the water fishing I will keep a Rod Glove on my rods, because instead of having our rods lying flat like on a bass boat, a kayaker's are stuck in rod holder straight in the air and when you get in the think stuff or by trees your rods will get all tangled in the branches. But by keeping a Rod Glove on my rods it prevents the tangled mess and protects my gear.